This is a Skmoose. 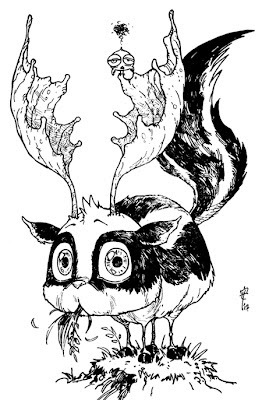 That is, a skunk mixed with a moose. Because it makes sense and we all know it's a real creature. Here's my late night home after Archer lets me go. Domo's poster wall and my aweshum computer desk. Hallway to everybody else's rooms, and the comic rack by the door. I want a Skmoose for my birthday. I'll get it right?